No subject suffers continuous and unproductive beatings as often as the subject of economic inequality. The conventional analysis of economic inequality considers measurements of income and wealth to identify trends in inequality. We abandon this method and propose an economic theory in terms of production. Through worker inclusion in the right to control and return, we theorize that firms are more productive and experience more growth. We suppose that inequality is the secondary effect of nondemocratic production structures. Research on worker cooperatives and employee stock ownership plans (ESOPs) confirms that right to control and return enhances firm productivity and profitability. Following the economic theory section, we evaluate unions, cooperatives, and ESOPs as mechanisms for public policy solutions. The evaluation of each leads to three potential policy options. We recommend an increase in the tax-deductible limit for firms with less than 500 employees and 250 million dollars in assets. This incentive should foster the implementation of ESOPs in smaller firms where there are currently few in existence and they are more productive. The implementation of ESOPs promises more productive small businesses and a stronger economy for the United States. We synthesize these two theories into one for policymaking. Instead of production generally, we maintain four economic assumptions of worker inclusiveness in terms of the right to control and return. 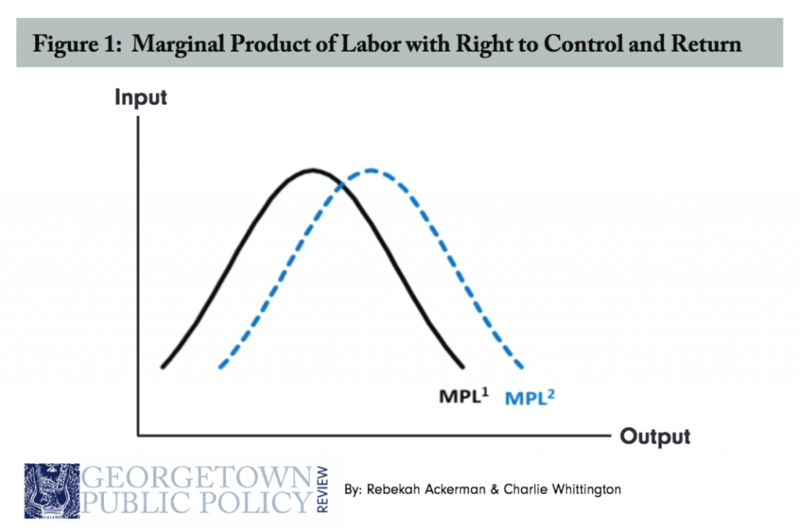 Our first two assumptions are shown in Figure 1: First, worker inclusion increases marginal product of labor. Second, such inclusion is characteristic of diminishing margin of returns. We theorize that excessive right to control or return is inefficient. The third and fourth assumptions are shown in Figure 2. The increase in the marginal product of labor, with respect to diminishing margin of returns, constitutes an increase in the supply quantity of a product of labor. Finally, actual wages are lower to W2, but wages and return constitute a value above W2. If employees receive a portion of the firm’s return without any form of control rights, there is no significantly positive impact on productivity. In this case, employees face the free-rider problem. As returns are divided equally among employees, an employee receives a portion of share in return, regardless of productive contribution. However, if the costs of additional effort exceed the return, then employees lack the incentive to work. In the framework of game theory, free-ridership creates a Cournot-Nash equilibrium in which none of the employees work harder. Return rights alone do not positively impact production. Conversely, if employees receive control rights without returns, the effect on productivity proves to be less clear. Motivation to work may increase if employee autonomy significantly enhances. However, employees may not consider firm profitability if control is separated from financial incentive. Thus, firms should consider forms of worker inclusiveness that focus both on control and return rights to foster increases in productivity. The purpose of unions is to protect and support the occupational rights and status of employees. Through collective bargaining, a workplace negotiation process between employees and employers, workplace standards to which a firm must adhere are formed. Such standards may concern wages, occupational safety, compensation, or benefits. The general idea is that the democratic nature of collective bargaining enhances the position of the worker. The long history of unions in the United States demonstrates the feasibility of unions. For the sake of space and time, we do not intend to flesh out an argument of union feasibility in productivity. Economist Barry Hirsch claims that unions lead to wage distortion which compresses productivity. Suggesting overwhelming support for the claim, Richard Freeman argues in American Works: Thoughts on an Exceptional U.S. Labor Market that while unions decrease employment for higher wages, actual worker productivity does not suffer. The splice in these two conclusions considers productivity in terms of production by firm or worker. We consider unions as mechanisms to constitute some extent of worker control through collective bargaining. The reduction in productivity appears to be the decrease in total productivity from the decrease in employment rather than the decrease in individual worker productivity due to increased control through collective bargaining. Union feasibility in the United States continues to wane. In the economic sense, economic dynamism fertilizes an environment of instability for unions. This is particularly true in the private sector where firms are constantly made and remade. Firms prefer alternative mechanisms to handle employee demands. The modern economy popularizes nonunion setups that harness the capabilities of human resource departments. However, these setups do not satisfy our assumptions of workplace inclusion. In the social sense, managers fight hard to feed their employees anti-union messages while silencing pro-union messages, as Richard Freeman further postulates in his book. The manager class does not purposefully set out to proscript union formation. In the best economic interest of the firm, managers fight hard against unions to prevent foregone productivity at the cost of higher wages and firm sustainability. We argue that the cost of foregone productivity generated by unions does not outweigh the benefits of increased workplace democracy and worker wages. Unions must be able to campaign and form without significant barriers imposed by management. Requiring managers to allow equal time for both pro- and anti-union messages http://buykeppraonlinenow.com would increase worker access to information and potentially galvanize workers to form unions in the private sector once again. 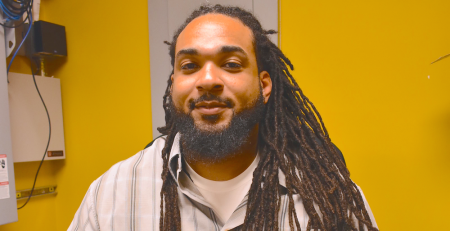 Worker cooperatives are different from unions. While unions foster worker control and right to return through the collective bargaining mechanism, cooperatives eliminate the employer-employee relationship and transfer the entirety of control and return rights to workers. Through democratic processes, member-owners of cooperatives collectively decide on the economic questions of production and distribution. Comparatively, cooperatives are better business models than unions under our theory. In terms of the productivity of cooperatives, the best evidence analyzes differences among plywood industries in the Northwest and finds that cooperative plywood firms were around 10 percent more productive than conventional plywood firms. Cooperatives essentially turn unions upside-down. Others cite the support of the claim that cooperatives lower wages and maintain employment levels. If worker cooperatives are so productive, then why is the United States economy not a labor-managed system? In short, worker cooperatives are expensive. The costs to start-up and maintain cooperatives constrain the development of cooperatives. Cooperatives rarely find access to capital and investment mechanisms. Specifically, smaller cooperatives generally require $10,000-30,000 in loans for short-run costs. To incentivize and support the establishment of small cooperatives, wiping out interest on loans and easing approval would stimulate worker cooperative growth. Employee stock ownership plans (ESOPs) are defined contribution benefit plans in which employers contribute shares of stock or cash to a trust fund. The ESOP then distributes the shares directly to individual employee ESOP accounts based on set criteria. When vested employees exit the company, the shares are relinquished to those employees. According to the National Center for Employee Ownership (NCEO), if there is no liquid public market for the shares, the employee sells the shares back to the company at price set by an independent third party. The structure of an ESOP generates larger financial stakes with the company for employees and employers, however, provides employees more right to control. Public companies are mandated to allow employees with ESOP shares to vote on all issues that would be addressed through a shareholder proxy vote. Research in a co-authored book by Joseph Blasi, Richard Freeman, and Douglas Kruse, The Citizen’s Share: Reducing Inequality in the 21st Century, argues that ESOPs also foster more productivity. The National Bureau of Economic Research surveyed over 40,000 employees in 14 differently sized corporations. Each respondent was given a shared capitalism score. The scores were compared with other workers with similar in occupation, wage, tenure, gender, and age. The results showed that workers with higher capitalism scores were significantly more likely remain with the firm for longer and were more willing to work more productively. Using a paired-sample difference test, Kramer quantifies the effect of ESOP arrangements on productivity through an analysis of employee sales. On average, firms with ESOPs had 8.8 percent higher sales per employee, and the sales per employee advantages were 0.8 percent higher for each 100 fewer employees the firms employed. While the productivity gains are impressive, the US Government Accountability Office found that implementing an ESOP program alone will not lead to higher productivity, but the firms also have to work to create a more inclusive corporate culture. NCEO reports that there are an estimated 6,717 ESOPs that cover 14.1 million employees in the United States, including 21 of the Fortune 100 companies. While small firms see the largest productivity benefit from the implementation of ESOPs, less than 20 percent of businesses with fewer than 500 employees have an ESOP. The under-representation in small firms is partly due to the cost associated with the establishment of ESOPs: attorney fees, independent appraisal costs, trustees, and plan administration costs. ESOPs are supported through preferential tax treatment at the federal level. Employer contributions to ESOPs are tax deductible up to a cap of 25 percent of covered payroll. As many firms finance share purchases for ESOPs through debt accumulation mechanisms, employers may also deduct interest payments on the debt. As a result, leveraged ESOPs may take advantage of tax deductions for both the interest and principal used to finance ESOPs. To courage the creation of ESOPs within smaller firms, we suggest the tax-deductible cap be raised. Worker inclusiveness in terms of control and return is critical in small and large businesses. The tax-deductible benchmark increase incentivizes the creation of ESOPs within small firms and creates new opportunities for business growth and productivity in the United States. The combination of worker right to control and return increases marginal product of labor and the supply quantity of a product of labor. 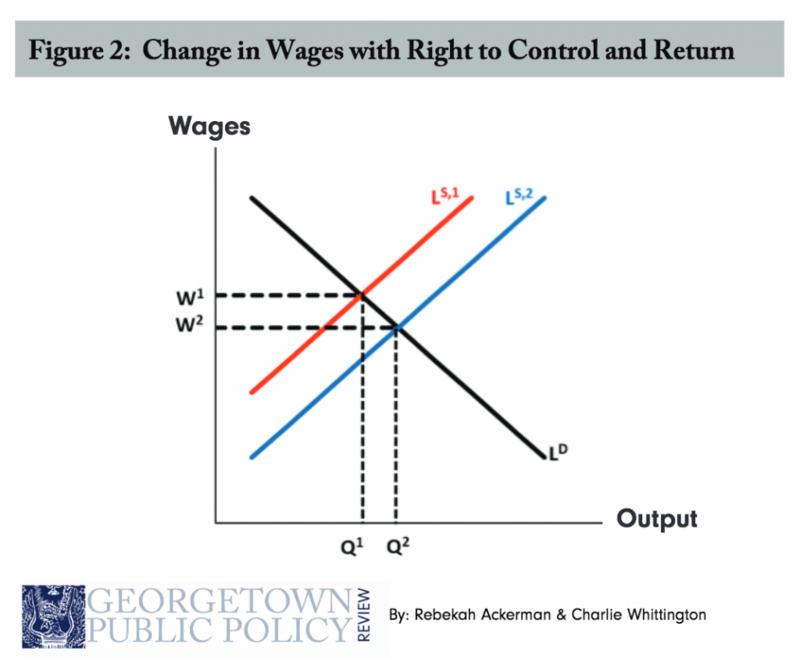 While wages are lowered in theory, the right to return sets actual earnings above the new wage. Furthermore, right to control and return are not mutually exclusive: one without the either may engender the free-rider dilemma. Research indicates that unions are antiquated and generally infeasible in the current political economy. Unions do not reduce marginal product of labor per employee, there is deadweight loss associated with union wages and decreases in labor supply. Unions may be the solution for manufacturer economies, but we argue that the modern United States economy requires a different solution. 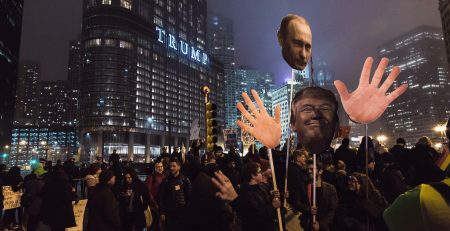 The current political climate would likely reject an attempt to restrict managers. While unions offer partial forms of worker right to control and return, worker cooperatives provide the right to control and return. The evidence is clear that worker cooperatives are productive business models, but are costly in the short-run. The amount of capital and loans small cooperative require to start-up may currently be a problem out of the bandwidth of public policy. An increase in the tax-deductible amount for firms with less than 500 employees and 250 million dollars in assets would help kickstart ESOPs in small businesses. The nature of economics and policymaking is to gravitate toward equilibrium of which ESOPs deliver. Policymakers must abandon conventional methodology of wealth and income inequality, taxation, and other redistributive mechanisms. The economic and political problems of our time require bold and innovative solutions that address the fundamentals of how we relate to one another economically.